This spicy Portuguese Chicken is quite addictive. I first had the Peri-Peri Chicken at the South African franchise restaurant called “Nandos” and loved it. The spicy peri-peri (or piri-piri) sauce made with bird’s eye chili, garlic, herbs, and lemon awakens your tongue and quickly salivates all over inside your mouth. Although the sauce itself has its origin marked at Portugal, it is widely used in African countries like Angola, Mozambique, and South Africa. 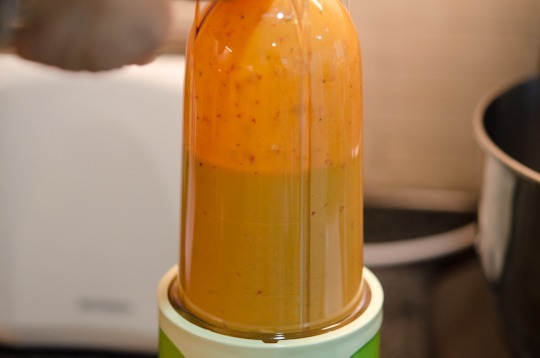 The spiciness of peri-peri sauce can be adjusted by the amount of chilies, or even using less spicy kind of chilies. 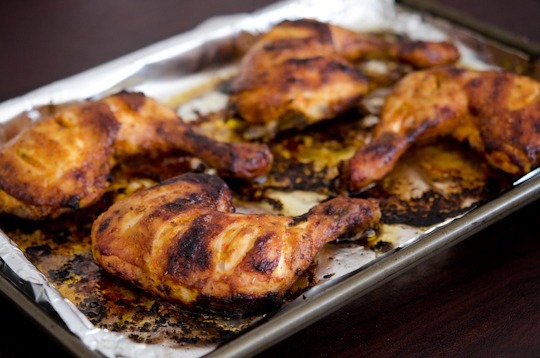 The best way to cook the Peri-Peri Chicken is to GRILL them. For not having an out door grill in my high rise cosmopolitan kitchen, I baked it in the oven instead. It came out great but, of course, the smoky grilled flavor would have been even better. If you have a BBQ grill, use it! The sauce can be made in less than 5 minutes, and all you need to do is to marinade chicken ahead of time. You will love this chicken IF you can bear the heat! I mixed two kinds of chilies to reduce some heat (bird’s eye is too spicy for me). Yes, I am a WIMP! If you want the suicidal heat…, go for 10 or even 15 of these tiny bird’s eye chilies. Pour 1/3 cup of sauce over chicken legs and spread all over. I scored chicken so the flavor will penetrate better to the meat. Marinade at least 1 hr. Overnight is even better. Place them on a pan lined with foil (Spray the pan with oil before you place the chicken). Bake them in an hot oven (425F) for 20-25minutes, baste with more sauce as you turn the chickens to the other side. 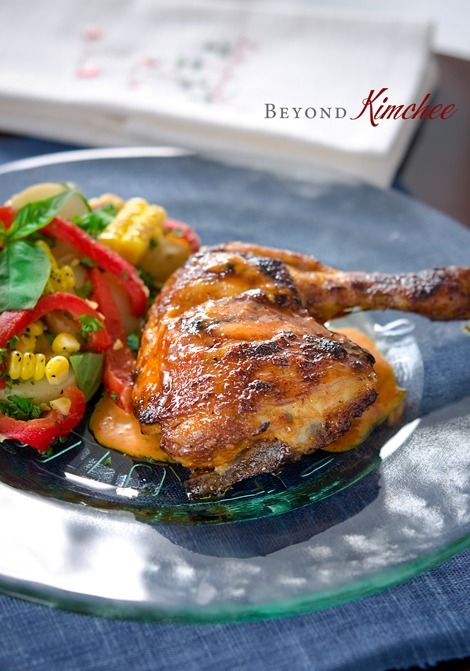 I served my families these Peri-Peri Chicken with potato, corn, and roasted pepper salad. I drizzle a little more Peri-peri sauce over the chicken to knock them out. Well, everyone survived and finished the chicken off to the bone. Dinner was done and the clean up was a breeze! In a blender combine everything except the chicken and the extra salt, blend until very smooth. Score chicken legs with a knife a few times. Pour 1/3 cup of the sauce over chicken and toss well. I sprinkle a few dashes of extra salt on top of chicken. 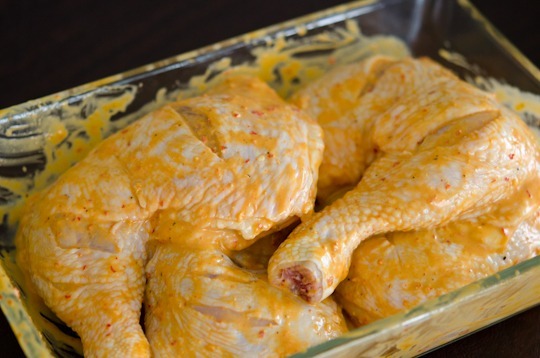 Marinade the chicken at least 1 hour or overnight. Grill your chicken or bake. 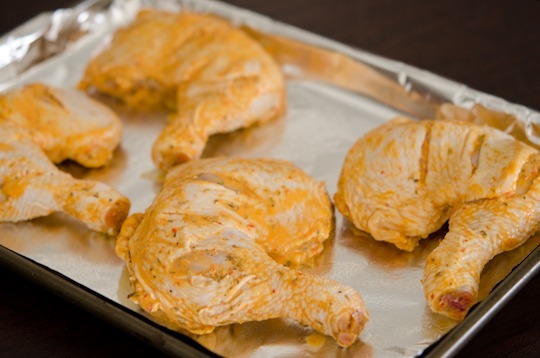 Place chicken on a baking pan lined with foil, spray with oil,and place chicken. Bake for 15 minutes, turn over, baste with extra sauce, and continue to bake for another 10 minutes or until chicken is cooked and browned. I love spicy! Don't often see the little bird's eye chilies, alas - although there are other things one can use. This recipe really would be great on the grill. Chicken is on sale this week at the supermarket - this might be making an appearance. Really good recipe - thank you. Bird's eye chilies are furiously spicy. You can substitute with red finger chilies to reduce the heat. I'm no good with chilies either, but love the nandos chicken! I always ask for the least spicy one haha. Thanks for sharing this, would love to try it soon, am sure my family would really enjoy. No need to pay nandos prices for these anymore! Hope you like it, Esther. I have been craving Peri Peri Chicken since I became addicted to Nandos while I lived in Wales just one short month three summers ago! So glad to see someone else finally shares my longing! I've tried to recreate their spicy chicken pitas, but my recipe so far just hasn't quite hit the spot. 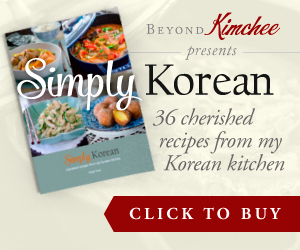 You can bet that I will be giving your recipe a try SOON! Now, if you figure out a way to make peri peri salted chips I will be impressed! :) Thanks so much for sharing your recipe! I know Nandos chicken is so additive. I hope you get to like the recipe. It is not exactly the same, of course, but will clam down the craving for sure. I have not tried peri peri salted chips yet. Can't wait to try them out. Dear Holly, I live in middle east, unable to find Piri Piri chilli, however found Bird chilli from Thiland. Does it same as Bird Eye chilli piri pieri OR its different and not suitable for the recipe. Please advice. Million Thanks in advance. You can use Thai bird eye chili. They are pretty similar. OMG this sounds amazing. Have pinned for another day, thanks. BTW You are welcome to join in my monthly food blogger event THE SOUP KITCHEN, here for entry details and current theme. New theme each month. All bloggers are welcome, hope to see you participate soon. Thanks for the invitation. I will think of what to make. I love peri-peri chicken! My friend from South Africa gave me some peri peri sauce and I use it all the time. I like the flavor it has not just heat! She also gave me some spicy Portuguese seasoning. It's good to have this recipe so I can still make it when I run out! :) Nice job! I've been wanting to try peri-peri chicken after seeing it on Australian blogs. It looks so easily and delicious :D Thank you for the recipe! Thanks Michelle. It is packed with flavor and I highly recommend to grill them if you can. Can you believe I've never eaten in a Nandos?! Every thinks it's criminal but I've never been that pumped to try it. Having said that, I LOVE chillies and these photographs are beautiful. Lovely post. Most people who have been to Nandos seemed to like their chicken. I did. If you like chillies you will love it. Everyone I know that's been has loved it - I must try! my brother introduced me to peri peri chicken when i visited canada last year and i swear i haven't stopped raving about it ever since! it tasted better than anything i have ever tasted!!! This looks amazing, Holly! Could you tell me where I can get those chicken legs? They look so much more elegant than drumsticks and I;d love to get them to try this recipe! Holly, this looks so good. Can't wait to try it. We miss you!! 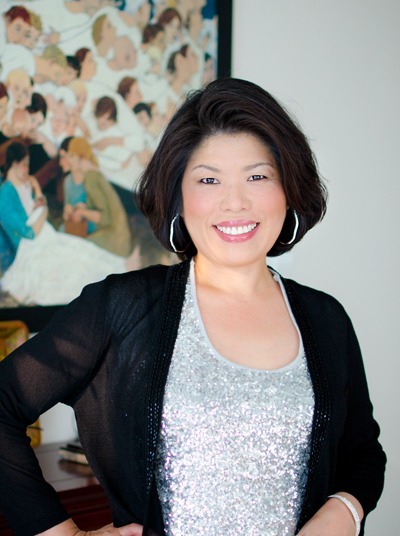 When I read your blog, I can hear your voice! Keep posting! Thank Lily. It is so nice to hear from you. I miss all of you, too. So delicious! The chicken looked amazing hot and sizzling out of the oven. I couldn't find birds eye chili in my supermarket and had to resort to poblano/jalapenos. Thanks for the wonderful recipe! Hi Yaoli, So glad to hear that you liked it. I love spicy peri-peri sauce and I believe it is as good as with poblano/jalopenos. Thanks for leaving the comment for me. I appreciate it. What a lovely blog to chance upon while searching for peri-peri craving-soothing daubs online :) I'm about to try this recipe out. I'll post back with results, I'm sure! I'm Portuguese and I was surprised to see this recipe here! 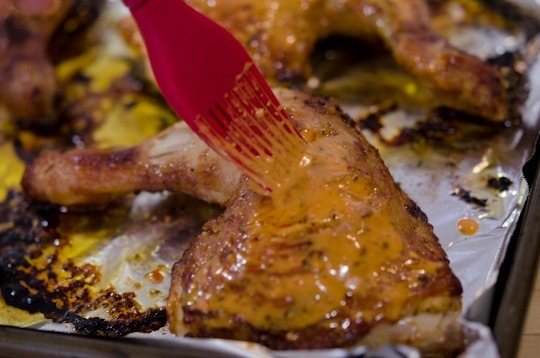 In Portugal it is called Piri-Piri Chicken, and it's a dish that reminds me of childhood days! We usually marinate the chicken overnight and after barbecued we put a little bit more sauce on it! And a tip is to eat the sauce that drips from the chicken with potato chips or bread! Just made this for dinner tonight and it was so delicious!!! My fiancee and I loved it! A great recipe which we have used many times now and is at the top of of favourites. We use the breast of chicken and score both sides to let the meat absorb more but that is the only difference in the recipe. The longer it marinates the better and we save some of the sauce to go in just before the end as we like more liquid on the plate. having a Barbie with friends, attempted to make your peri peri marinade but unfortunately never turned out as mus-tardy col and liquid...but a paste kind of sauce..proof will be in the pudding..in all honesty never used the quantities mentioned but perhaps half of them....nevertheless can't wait to put my chicken thighs on the coal...Thanks Holly!!! So, I'm kind of loving your site right now. I've just started to let my chicken marinate. I'm planning on leaving it for a good four or five hours. Unfortunately, I could not find any bird's eye chilies, so I am using red habanero peppers for comparative heat. I'm also using a couple of red Mexican chilies, and a sweet bell, to see how it works. Thanks so much for these recipes! Hopefully, mine will come out half as delicious as yours seem to have done. I think I'm going to try your cola braised chicken next. Hi Guerdy I hope your peri peri chicken turned out good. Thank you for your sweet comment. The cola brasied chiken is another popular recipe from my blog. Hope you like it, too. Made this tonight and it was delicious. I wasn't able to locate bird's eye peppers, aka piri piri peppers ( probably get them at the chinese grocery) so I used 5 Serrano peppers. It was spicy but I could have taken a little more heat. Habaneros might make a good substitute using fewer. Your milage may very. cold and snowing here so I baked in a rack over a pan. When I'm grilling or baking like this, I like to cut the backbone out of a whole chicken, flip it and remove the breast bone/cartilage and flatten the chicken out and bake on a rack or grill whole. I think it keeps the chicken moister than when cooked in pieces. quarter it to serve. This was plenty of sauce for a whole chicken. This smelled great cooking and was a big taste hit. I cant wait to grill chicken this spring / summer. Hi Don You are right. Cookig the whole chicken will bring better in flavor and more moist. I am glad that your peri peri chicken turned out great. I didn't have any dried oregano or a bay leaf so had to omit those, and I used 7 small hot chilies. My lemon gave me 1/3 cup juice. Mixed it all up and after tasting decided I overdid it with the chilli, so added in 1/4 of a medium brown onion, otherwise followed the recipe. Butterflied and scored a 1.64kg chicken, rinsed and patted dry and marinated with half the mixture for 2hrs in the fridge. Fired up my weber go-anywhere hibachi grill with some lump charcoal (nice sunny day in Sydney) and cooked it for 10 mins turning and basting every couple of mins to get the crispy skin (this unfortunately used up the rest of my sauce) then moved all the charcoals to the sides and cooked with the lid on / indirect heat for 30 mins, checking every 5 mins towards the end to see if the juices from the thighs were running clear. 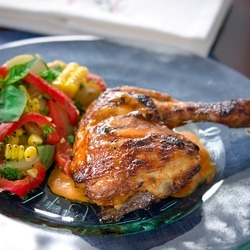 Result: Best peri peri chicken I've ever had, and I've been to my local Nandos a few times. I even had to stop my wife eating the skin on the leftovers - thanks a million for sharing! I've made this several times now (most recently having piri-piri pork roast) and found that the heat from the raw sauce and the heat of the food once cooked in very different. The sauce is going to taste very hot when mixed, but the heat cooks down such that the finished product is much less spicy hot than the raw sauce. I keep turning up the heat by adding peppers. I really love this sauce and can't wait to use it on the grill. This was indeed a flavorful recipe. 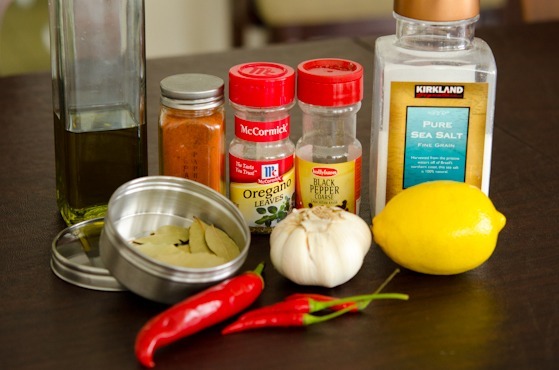 I added several tablespoons of white vinegar to the marinade to give it more of a tangy flavor. It worked out really well! I used red Thai chili peppers (they look very similar to the piri-piri) and the spicy-ness was just right, for my family at least. For cooking the chicken, I baked the pieces at 350°F for about 30-35 minutes. Then threw them on the grill at med-high flame for no more than 10 min, open lid, or until charred at your liking. Baking the chicken prior to grilling locks in the flavorful juice and cooks it, so you don't end up with dried-out chicken, with uncooked parts near the bone. 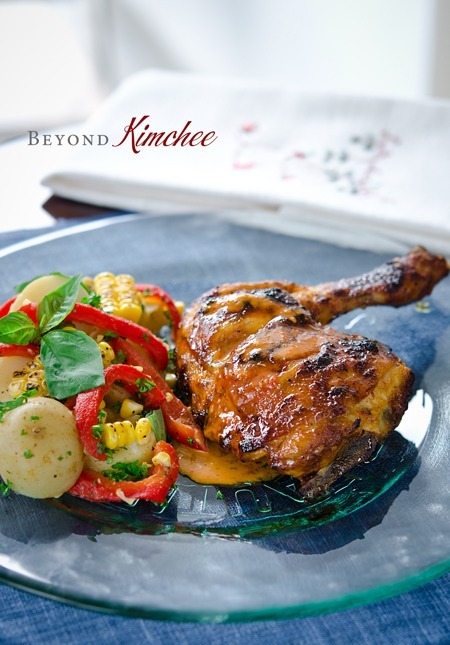 The result is juicy, fully-cooked, tender chicken - with the must-have grill flavor and texture. I recommend this technique for all BBQ chicken recipes. This recipe is GOLD. Left the house smelling the nandos for the whole night! Thank you so much! Thanks for the wonderful tip of pre-baking the chicken. I think that will help chicken to stay moist and cook evenly without burning the skin outside. I am so happy to hear that you liked this recipe. I can't wait to have an outdoor grill someday so that I can try my recipe on the grill again. Hi, I worked at Nandos for a few years and this recipe is very close, if anything I think it's better. Personally I double the chillies because after working at Nandos and living in Asia I don't find birds eye chilli that spicy! HI: JUST FOUND YOUR SITE, LOVED THIS CHICKEN WHEN WE WERE IN PORTUGUAL. WOULD LIKE THE RECIPE FOR THE POTATO, CORN & ROASTED PEPPER SALAD, IF POSSIBLE. THANKS FOR YOUR TIME. Being Sourh African,I grew up eating peri peri. Chicken,chicken livers,beef strips ect. Hope you don't mind me adding a little something to your recipe? 1. Cut the chicken lengthwise along the bone making sure to cut to the bone. 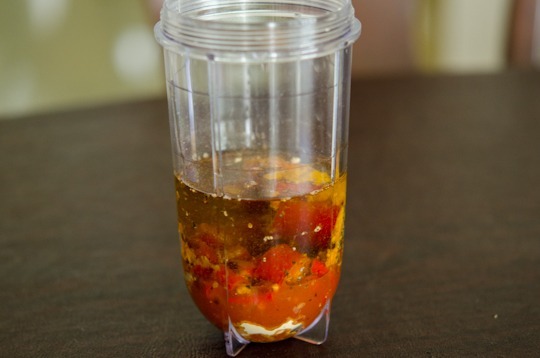 This allows the marinade to impregnate all over. 2. Add a spoon of marmalade. 3.double the amount of Crushed Garlic. Hi Robin Thanks for the suggestions. Marmalade sounds very interesting? Does it add a little sweetness and the fragrance of orange to the chicken? Hello, I wanted to make a whole bunch of this for an upcoming dinner party and I was unsure of how to increase the size of the sauce recipe to fit a gallon yield. Could you help me out with this? Hi Ram Gallon size? Wow, that is a lot of sauce to make. You can multiply many times of this recipe. I wouldn't worry much about following the recipe to the T since the taste can depends on the particular flavor your prefer. If you like it spicier, add more chili. If you like more tang and sour, add more lemon and even add a some red wine vinegar too. After you make the sauce, taste it to see if you like the flavor. You can always adjust the amount of each ingredient for your liking. Good luck! Can you please post the recipe for your potato, corn, and roasted pepper salad-- that sounds yummy with it! Can i use that reciepe on chicken drumsticks instead of legs? Hi, Holly! Thanks for sharing such a great Peri- Peri Chicken. I must say that the Peri-Peri sauce recipe that you shared with us is quite authentic and delicious. I made my first home-made Peri-Peri Sauce, last night. i love spicy food so I used 16 bird's eye red chilli peppers 4 table spoon of black pepper powders and 4 table spoon of Paprika powders. The sauce and chicken turned out well. Hi, Holly! I love eating Per-Peri Chicken at Nando's and I must say that your recipe is as great as the one served at that restaurant. I love spicy foods so I used 16 Bird's eyes Chilli peppers along with 4 table spoon of black pepper powders and 4 table spoon of paprika powders. Thanks, Denny. So happy to hear that you loved my Peri-Peri chicken recipe. I like the idea of adding lots of bird's eye chili and paprika. So delish!